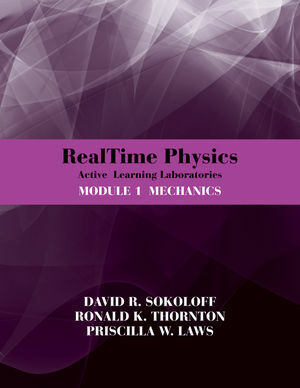 The authors of RealTime Physics Active Learning Laboratories, Module 1: Mechanics, 3rd Edition - David Sokoloff, Priscilla Laws, and Ron Thornton - have been pioneers in the revolution of the physics industry. In this edition, they provide a set of labs that utilize modern lab technology to provide hands-on information, as well as an empirical look at several new key concepts. They focus on the teaching/learning issues in the lecture portion of the course, as well as logistical lab issues such as space, class size, staffing, and equipment maintenance. Issues similar to those in the lecture have to with preparation and willingness to study. David R. Sokoloff is the author of RealTime Physics Active Learning Laboratories, Module 1: Mechanics, 3rd Edition, published by Wiley. Ronald K. Thornton is the author of RealTime Physics Active Learning Laboratories, Module 1: Mechanics, 3rd Edition, published by Wiley. Priscilla W. Laws is the author of RealTime Physics Active Learning Laboratories, Module 1: Mechanics, 3rd Edition, published by Wiley.